Conditions for investing in gold and speculating in the Silver Dip are growing better. My friend Rich Checkan at Assets Strategy International sent me this note on Monday. Gold price continues to hold its position around $1,290 per ounce in response to a stronger dollar and softer treasury yields. Gold price got a slight boost up to $1,296.40 per ounce on Wednesday on news that North Korea may cancel the meeting with President Trump. It has since retreated back to around $1,290 per ounce. Lower Relative Strength Index (RSI) figures indicate an oversold gold market, making now a good time to buy gold with a long position. The current RSI sits around 32, and generally when this level drops below 30 in a 14-day period, investors should consider buying. On the flip side, an RSI above 70 indicates a sell signal. Experts say if gold hits $1,285 per ounce, gold will present an excellent buying opportunity. There is another tactic to speculate in precious metals without investing a penny. This is explained in my report “The Silver Dip”. Once this type of portfolio is in place, it can be enhanced with select speculations in precious metals when the price of these metals are in ideal conditions for speculation (as they are now). The equity portfolio is used as collateral to make a conservative margin investment in precious metals ETFs. Such leveraged speculations make the most sense when metals are at good value prices as gold is now. I have spent substantial time researching to determine a fundamental real value for gold based on genuine purchasing power. The math I use suggests that gold should be priced at about $1,350 and ounce at this time. I work on the premise that above $1,350 an ounce, buying gold is a speculation that is not supported fundamentally. Next I check our trend advisors at Tradestops.com. The Tradestops analysis shows that gold is in an upwards trend and has been for five months. There are three main factors we watch at Tradestops. First we look at the Stock State Indicator (SSI) of the share. In the case of GLD below, the SSI is in the green zone. The SSI is based on a mathematical analysis of a share’s price for the past 521 trading days. An SSI in the green zone indicates that the stock is performing well and has not corrected below its recent high. If a stock has not yet hit this price, it is still on an uptrend and safe to keep holding it. Tradestops analysis for the gold ETF symbol GLD. The Tradestops analysis of SLV shows that this silver ETF is in a downwards trend and has been for the past one year. An SSI in the red zone indicates that the stock has corrected more than its VQ% below a recent high. The stock is not behaving in a way that is usual based on its historical market trend. Tradestops analysis for the silver ETF symbol SLV. This analysis suggests that this is a good time to speculate in gold, but not in silver. 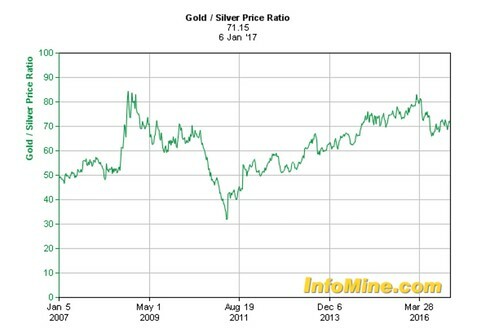 However when the gold-silver price ratio is at 80 or above, history suggests that the price of silver will rise faster than the price of gold. This means that right now the price of gold is a good value, but silver may be an even better investment than gold. The threshold we watch for is a spread of 80. When the price of gold is 80 times (or more) higher than the price of silver history this suggests that silver is undervalued to gold and will rise faster than gold. 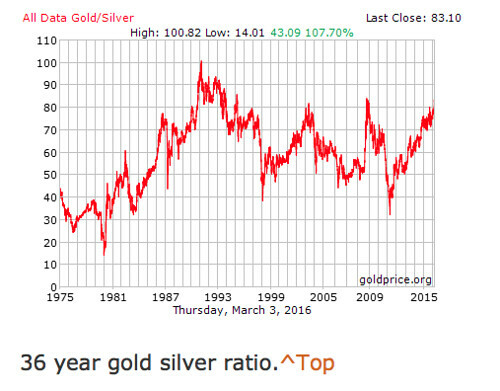 Rarely has the gold-silver price ratio been as high as 80, only three times in the past 36 years. Last month the ratio shot up to 81! 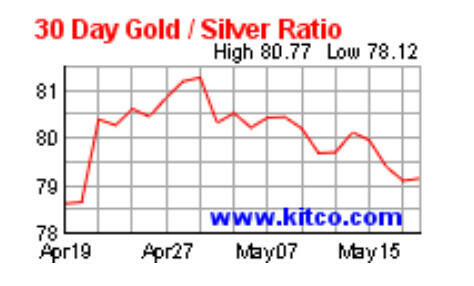 However the May 21, 2018, 30 Day Gold-Silver Ratio chart from Kitco.com below shows that the gold-silver price ratio dropped back below 80 around May 1, 2018. The chart shows that silver’s price has been rising faster than gold’s prcie and this is an early indicator that silver’s trend may be ready to reverse. The next indicator we’ll look for is the Tradestops entry alert that shows the silver ETF’s price is on the rise. Momentum is a key component of Tradestops Stock State Indicator (SSI) system. The TradeStops Stock State Indicator (SSI) entry signal is a very conservative signal. 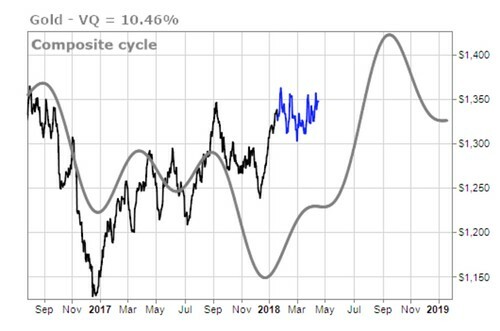 It requires a stock to have made a bounce off the bottom of at least one Volatility Quotient (VQ) percentage and the stock’s trend must be strongly positive. That entry signal will be strong suggestion that silver’s price is on the rise. The big benefit to an overall portfolio’s return is that any profits created on margin purchases are pure profit that come with with no extra invested money. When is it good to invest in gold? Hi Gary, Looks like a fair chance (according to today’s WSJ) the US Dollar may get stronger for a while. If that occurs, how would that most likely affect the price of gold and perhaps silver? Thanking you in advance. I sent this reply: There has traditionally been an inverse relationship between the trade-weighted U.S. dollar and the price of gold. This was fundamental under the gold standard. Once the standard was gone, there was only a psychological tilt towards gold whenever the value of the U.S. dollar increases and vice versa as the chart below shows. However, dollar strength is just one factor. As the dollar becomes less of the reserve currency of the world that factor weakens. I think inflation and interest rates and stock market prices are far more important factors that will affect the price of gold. I gave up long ago trying to figure out short term moves of metals or currencies. For example, the premise in the Wall Street Journal article has to be suspect. My experience is that tomorrow an article in the same paper could suggest why the dollar will fall. There are too many unknowns to think we really know. I have tried to determine a basic real value for gold based on genuine purchasing power. The math I use suggests that gold should be priced at about $1,350. I work on the premise that above $1,350 an ounce, buying gold is a speculation that is not supported fundamentally. Below the price of $1,350, I work on the theory that gold is a good deal for long term investing. Any other investment is a speculation. I believe that investors should wait for ideal conditions before taking this type of risk. You can read all about it and why I favor gold and silver in our latest Silver Dip Report. Here is why we need to use mathematically based value information, rather than economic news, to make investment decisions. Come back with me in time. Take advantage of my 50 years investing experience. Gain lessons learned from my decisions. I was a gold and silver speculator in the 1970s and 1980s. My profits came when gold and silver spiked in the late 1970s. “This will go on forever”, I thought. Secretary Brezhnev died November, 10 1982. A power struggle took place in the Kremlin. Yuri Andropov became the new General Secretary. US−Soviet relations deteriorated rapidly. In March 1983, President Ronald Reagan dubbed the Soviet Union an “evil empire”. September 1, 1983 the Soviets shot down of Korean Air Lines Flight 007 with 269 people including a sitting US congressman, Larry McDonald. This historical chart of gold’s price (that period is lined in red) shows how that went well. The article says: Gold prices fell to a nearly two-month low Monday, weighed down by a stronger dollar. Gold for December delivery edged down 0.7% to $1,275.80 a troy ounce on the Comex division of the New York Mercantile Exchange—the most actively traded gold contract’s lowest close since Aug. 8. Prices have fallen in four of the last five sessions and in three consecutive weeks since hitting their highest level in more than a year, with concerns about interest-rate increases and a stronger dollar hurting the precious metal. Investors have also largely shaken off recent geopolitical risks, weakening demand for gold and other haven assets that typically rise during times of political turbulence. Gold prices fell Monday even after voters in Catalonia backed independence from Spain in a referendum that was boycotted by opponents and marred by violence, and after President Donald Trump rejected dialogue with North Korea. This could suggest that its time to sell gold. My math based value assessment suggest the opposite. It’s closer to the time to buy gold. There are seven layers of tactics in the value based Purposeful investing (Pi) strategy. An “ideal condition” is a rare distortion of an economic fundamental that history has shown “almost always” reverses itself. The words “almost always” indicates that there is always risk, but our in depth analysis of gold’s price at Pi shows that based on inflation anytime gold drops below $1,225 the price is distorted, is a good value and is time to buy. In other words we are at a price where its almost time to begin accumulating gold. More of yesterday’s Wall Street Journal news “U.S. Stocks Close at Records” (2) suggest that US shares are really hot. The article says: Dow industrials, S&P 500, Nasdaq Composite and Russell 2000 close at records together for the first time since July. Major U.S. stock indexes advance. Euro falls after Catalan vote. Spanish bonds, stocks under pressure. U.S. stocks clinched new records Monday, as fresh economic data bolstered investors’ beliefs in a resilient economy. Over past decades I have experienced how readers react when markets continually jump from high point to high, so I am issuing the following warning for the third time in a week. What we do know is the value of the US market compared to its history and to other stock markets around the world. 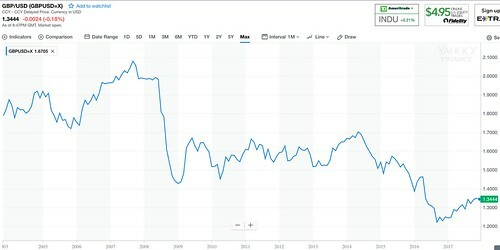 The numbers below from Keppler Asset Management, another source of data we follow at Pi, shows that the price-to-book of the MSCI US Share Index at 3.13 price-to-book is still well below the super inflated price to book of 4.23 in December 1999. A bear will again descend on Wall Street. The autumn and winter months ahead are a likely time. All stock markets have risk and volatility, but that if you invest in the top ten good value markets, that have a price-to-book of just 1.43, this is a much better deal than paying 3.13 price to book for US shares that are their record high. Take extra caution in your equity investments now. The volatility quotient of the DJI is about 10%. The trend is bullish so the trend won’t break until the DJI drops below 20,000. That could happen in minutes tomorrow… or any day. Create a plan based on math based good value economic data. Include watching the price of gold. When the crash comes, stick to you plan. Is a Gold Bull About to Begin? Where is the price of gold heading? I have worked with our friends, Michael and Rich Checkan, at Asset Strategies International (1) for almost 30 years. Here are some important thoughts in a recent interview Rich conducted about the price of Gold. You may remember Ronald-Peter Stoeferle, Founder of Incrementum Asset Management and author of In Gold We Trust, from our previous interviews with him. Ronald has just published the 11th Edition of the In Gold We Trust Report, and we’ll be discussing the shattering flaws caused by the current economic euphoria and how we may very well be in a gold bull market. Rich: In your 11th edition on the state of the economy and the prospects for the future, you use the term monetary surrealism to describe the present situation. Can you elaborate? Ronald: I refer to the strategies used by Central Banks to create false liquidity by simply printing money. In the first quarter of 2017, the world’s largest Central Banks created the equivalent of 1 trillion U.S. dollars. This liquidity supernova allowed investors to pump billions into equities, forming the illusion of prosperity, to which we seem addicted. Rich: You report we are in the earliest stages of a gold boom. Can you connect the dots between your premise and the actions of Central Banks? Ronald: Everything seems rosy when you manipulate the economy, but the moment there is a printed money pullback, we will have recession. Analyst Jesse Felder—founder, editor, and publisher of The Felder Report—calls the current euphoria “an everything bubble.” When this happens, gold will be king. It is for this reason that we say: This is already the moment for gold. Rich: The Federal Reserve seems so confident in the economy that it plans to raise interest rates. Won’t better rates turn some investors away from gold? Ronald: The Fed is ignoring any possibility of recession. But, it knows the truth. In Q1 2017, the economy expanded by only 1.2%, with 2% inflation. These hikes are a gesture to show false confidence, and we believe rate increases will only be temporary. 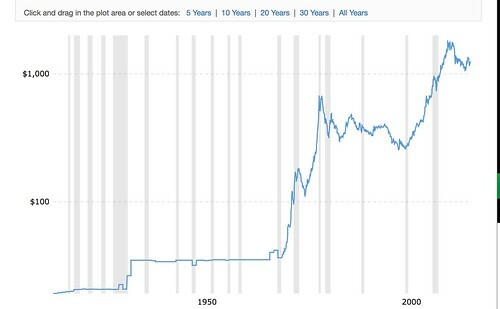 Remember this—since 1914 there have been 19 rate times like these; 16 of them were followed by recession. Rich: Despite your recessionary stance, how do you explain the position of most analysts that the stock market will continue to boom? Ronald: Out of 89 analysts at the big banks, whose opinion is followed and published by Bloomberg, none of them predict a recession in the next three years. Why? They are all in stocks. 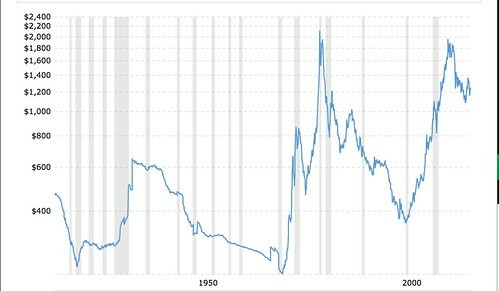 The ratio of financial assets to real assets like gold and tangibles is the lowest since 1925! This myopia will only deepen the crisis when it occurs, and it will be an interesting moment for gold. Rich: The Federal Reserve uses different types of ‘fiscal stimulus’ to prevent recession. Won’t they be able to prevent another recession? Ronald: The strategies get more and more desperate. The Federal Reserve may actually buy stocks as did the Japanese, to avoid a crisis. This can only worsen our economy. In any healthy economy, recessions are normal and make us stronger. The longer we avoid recession, the more disastrous the next burst of the bubble will be. Rich: How do you think people have responded to the current economic climate? Ronald: There is a rise of popularism throughout the globe. We see this as a symptom of disenfranchisement, of an economy not doing well for the majority. It is a disturbing fact that between 2005 and 2014 in the United States, three quarters of the households had stagnating income. It is a bad sign when people vote for change. The wealthy investors are propping up the market, but they don’t understand what’s happening in rural areas. Despite market euphoria, these are not good times. Rich: What does the present rise of popularism and market euphoria mean for gold? Ronald: The present euphoria is based on soft data and economic confidence. But the hard data, like tax receipts, are very weak. When there is such a gap between what is really happening and what investors think is happening, it’s time to buy gold. You need to shore up the crisis side of your portfolio. Rich: In your report, you include a must-read chapter citing Trump, Pence, and an interview with Dr. Judy Shelton, advisor to Trump’s economic transition team and Director of Sound Money Project at the Atlas Network. Can you give us a brief overview? Ronald: Vice President Pence made a wonderful speech on the importance of sound money. Trump himself speaks of the flaws in the U.S. dollar and a centralized system. He believes that to re-industrialize the United States, we need to weaken the U.S. dollar. Gold flourishes when the dollar is weak and inflation is high. We have heard President Trump say he would like to increase inflation by 45%. This means rising prices for the average man and rising gold prices for the smart investor. It could also mean stagflation, inflation with low growth. This is what happened in the 1970s. It was a terrible decade for investors and the best for gold. Dr. Shelton alludes to a “dependable dollar” and has submitted a proposal for a gold-linked treasury bond. An administration that connects monetary policy to real economics and seeks a weakened dollar to promote trade leaves gold in a desirable position for investors against the dollar. Rich: Let’s address the elephant in the room. Gold has not skyrocketed this year, but equities have taken off. Do you see a turnaround coming? Ronald: Yes, gold is cheap right now. 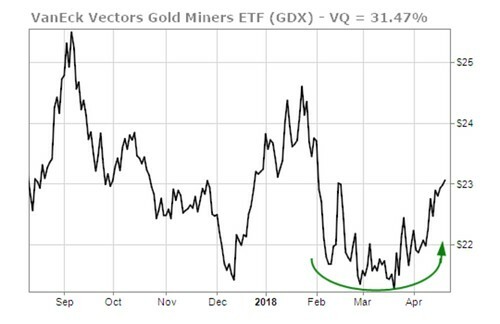 But, last year commodities made a turnaround, mining companies learned to operate most efficiently, and we are in the very early stages of a new bull market in gold. On average, gold is up 5.88% since the beginning of the year, and the influx of gold into ETFs is increasing since 2016. Investors must have the foresight to buy early before the herd. Rich: You also touch on Bitcoin in your report. What is its relevance to gold? Ronald: Bitcoin and other digital trading units are competitive alternatives to fiat currency. That’s a positive development in our estimation for gold. It shows that in general, there is less confidence in money printed by governments than ever before. Bitcoin may be a game changer for which gold is the role model. But, they are two separate asset classes. Bitcoin’s $66 billion cannot compare to gold’s $7 trillion market capitalization. That makes gold the alternative currency of choice for conservative investors to steady their portfolio, while Bitcoin and other crypto-currencies are part of your risk dynamic. Rich: Let’s talk about Black Swans and Gray Swans—unexpected events that herald a rise in gold. Ronald: First, look at artificial asset price inflation, consumer debt, and stagnating tax revenues—all of which spell recession. These represent the unimaginable Black Swan for most. Then, there is the Grey Swan of China facing a credit crisis. When turmoil happens in any country, gold shines. As I believe your readers will see in the year to come, these Black and Grey Swans are likely, and all point to the value of gold, now. As Stoeferle argues, the current economic climate and the strength of the U.S. dollar suggest another recession could be on the way. One of the best ways to protect yourself and your loved ones from economic downturn is with gold. Throughout the centuries, gold has always been a reliable and valuable source of wealth worldwide. If we look to the past as a reference, we could very well be on our way to another economic shift. For an exclusive copy of Ronald’s report, click here. Turn $250 into $51,888… in Four Years or Less? What is the real value of gold? Everyone should have a holding in precious metals, but as an investor who started accumulating (and speculating in) gold almost 50 years ago, I have learned (often the hard way) that precious metals should only be accumulated when their price makes them a good value. Even then, one must expect the price to rise and fall in unexpected ways. This begs the question, “When does gold’s price represent good value?” Today I am sending you a deep analysis, based on these 50 years of experience, of gold’s pricing in terms of inflation that hopefully helps answer this question. This research is part of a $39.99 report, but I am sending it to you free and without obligation. 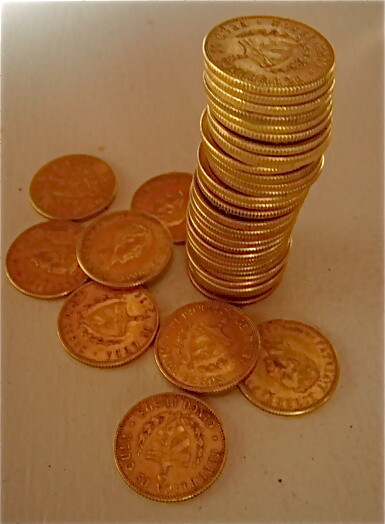 Cuban 1/10th ounce gold coins. A collapsing US dollar is one of the greatest risks we have to our independence, safety, health and wealth. Yet there are many signs that the greenback’s strength is in serious jeopardy. One frightening statistic is the hundreds of billions of trade deficit that the US incurs year after year. Many other factors such as growing federal budget deficits and low national savings mean that trade deficits are likely to widen even more. Larger federal deficits and the huge national debt are another problems. When the Dow Jones Industrial Average recently passed 20,000, another milestone of “20” took place that has a much darker meaning to your and my spending power. The U.S. national debt passed the $20 trillion mark. The problem is that the Dow is likely to come back down below 20,000. National debt probably will not fall. In the past decade US debt nearly doubled beyond all the debt of the US Department of the Treasury since 1790. The Congressional Budget Office estimates that the rate of debt will continue to rise for at least ten more years. That debt does not include state and local debt. That debt does not include agency debt (debt issued by federal agencies and government-sponsored enterprises) which is “guesstimated” to be another $8.6 trillion or so. These dreadful numbers do not include unfunded liabilities such as Social Security and Medicare. Federal National Debt per person is about $60,923. Add in all the other debt and every American owes over $100,000! How can America pay this back? The answer is they cannot. Payback, however, actually does not matter. No one expects the US to pay back their debt. Investors do expect the US to pay interest on its debt and this creates the really big problem of rising national debt service. During most of the last decade when the national debt was skyrocketing, interest rates were plunging and have remained really low. Now rates are expected to rise as will the US debt service. 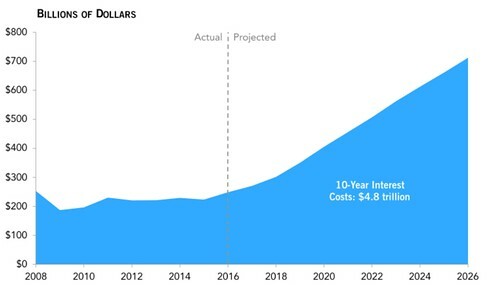 The chart from the Congressional Budget Office (CBO) shows that debt service is expected to more than triple in the next ten years. This is an extra half trillion dollars a year that won’t be spent on roads, on the military, on health care, the environment or schools. That rising debt service creates a vicious cycle that can only lead to a devaluation of the US dollar so the debt can be paid, but in phony terms. This is why investors need to own gold and precious metals. However, because metals are commodities and markets fluctuate for many reasons, gold is not always a good value. Good value investors look for “ideal conditions” before they invest long term in gold. There are times when a rare distortion in gold’s pricing occurs. When gold’s price drops to a point of value history has shown it will “almost always” rise. The only question is time. The words “almost always” indicates that there is risk. There is always risk that a basic fundamental has changed and will not correct in any targeted period of time. Or a new fundamental has shifted dynamics to such an extent that the distortion never corrects. There is always risk. Profit is the reward for taking that risk, but there is always a chance of loss which is why we should always seek a price that represents good value. The way to look for gold’s ideal price is to compare it to inflation. This is not as easy as inflation is hard to define. Also gold’s price was fixed for many years at $35 an ounce. There is confusion as to what the real price of gold should have been at the end of the war. Here are a few theories that can help us understand the relationship between the price of gold and cost of living. First, we use gold’s 1944 price and the costs of houses and cars and wages at the same time. Since the mid 1940s, US median income increased 29 times. House prices rose 47 times. The cost of cars jumped 36 times. Gold was up 35 times in the same period from $35 to $1,235 an ounce. If these conclusions are accurate, it means that gold was a reasonable hedge against inflation. Had you stored a pile of this precious metals in 1942 to buy a car, now you could do it. A house maybe not, but the statistical house purchased today might be very different from the statistical house purchased in the mid 1940s. The gold/cost of living relationship is true for the cost of going to a movie, up 33 times. Apartment rentals are up 34 times as well. But other basics have inflated far less. Gas is up 19 times, but of course bounces around a lot. Postage 16 times. Bread 21 times. Sugar 10 times. Hamburger about 13 times. Coffee 11 times. Eggs 13 times increase. Milk 16 times. 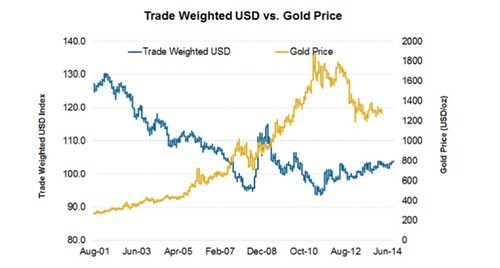 This first comparison suggests that gold is not necessarily badly undervalued at a price of $1,225. If the conclusions of the inflation are correct, this first comparison suggests that anytime gold drops below $1,225 it is likely a fair value, priced about where it should be in relationship to other costs of living. Another way of looking at inflation is to lump all the price increases together. In this instance (according to the inflation calculator website that uses the graph above) prices overall have risen 13.7 times since the end of WWII. This second comparison would suggest that gold, up 35 times, has risen far more than inflation and is not a good value at $1,225. However, because the price of gold was fixed at $35 an ounce, the original price must be suspect. If we use the 1944 inflation rate and compare it to the price of gold in 1971, we see a value conclusion similar to comparison #1. Gold is a fair value at around $1,225. Why 1971? That’s the year President Nixon told the Fed to stop honoring the dollar’s value in gold. That meant foreign central banks could no longer exchange their dollars for U.S. gold, essentially taking the dollar off the gold standard. Unhinged from the dollar, gold quickly shot up to $120 per ounce in the open market. This $120 price is a glimpse of what the correct price of gold may have been in the mid 1940s. If this third theory is correct, the price of gold has risen from $120 to $1,225, up about ten times, less than the 13.7 times inflation from 1945. On the other hand, gold’s price rise from 1971 is still much higher than inflation from 1971 until now. The inflation calculator website’s chart below shows inflation since 1971 has pushed prices up 5.8 times. This would suggest that gold around $696 an ounce would be a good value. However, since the $35 an ounce gold fixing obscures the true price rise, if we split the price half way between the $35 and 1971 price ($120), we get perhaps a more accurate view. The adjusted price is $77. If $77 was a more accurate real value for gold in the mid 1940s, then its price has risen 15 times and is in line with the 13.7 times cost of living increase. 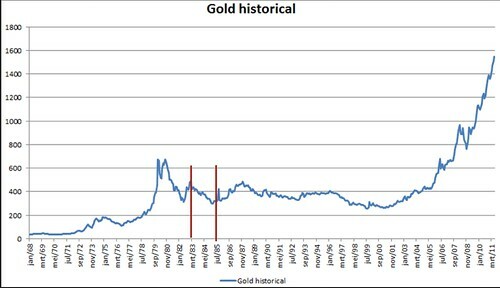 The fourth comparison uses a chart from Macrotrends.com that shows the price of gold since 1905 without adjusting for inflation. The same site has this chart showing the price of gold based adjusted to the Consumer Price Index. In this comparison, gold’s actual price is almost the same as it adjusted purchasing power price, around $1,235. The comparisons above are indicators that the price of gold is likely to continue rising and falling along the cost of living increases from a current fair value of $1,225. This is the premise we use in our good value investing course Pi. We keep the $696 price in mind when we calculate potential draw downs, in case the assumption of a $1,225 fair gold price turns out to be horribly wrong. These comparisons crystallize the fact that there is risk when it comes to speculating in gold. They remind us never to speculate more than we can afford to lose or at least hold for extended periods of times. They also remind us not to catch a gold fever when we read claims of $2,000 or $5,000 an ounce gold! Eventually the huge American debt will fire up inflation again and that will eventually turn into mega inflation. Then gold prices may shoot that high. In the interim whenever gold drops below $1,225, it’s probably a good value and investors who accumulate below that price will do well. There are other ways to cash in on precious metals. One approach is to keep an eye on the Gold Silver ratio. When the Gold Silver Ratio reaches 80 and gold is at or below $1,225 a speculation in silver is most likely to be a good value. There are numerous ways to invest in gold and silver, as a short term speculation for quick profit or for long term accumulation to combat the fall of the dollar or whatever currency you hold. America is not the only country with an overvalued currency. Whichever approach you choose, if you apply these value principles, your odds of increasing profit and avoiding serious loss improve. This fact rules the price of gold and precious metals which is why I look at owning them is never an investment but a speculation. Precious metals are financial insurance against inflation for sure. But isn’t all insurance a speculation ? I have never had a fire in my house, yet fire insurance does make sense. So let’s look at how to refine the process of buying, selling and owning precious metals a bit more. For example see why the Kunlun mountains (below) can have an impact on the price of gold, that’s not even related to mining. In February and March 2017, a significant economic event took place that can have an impact on the price of gold. Updates in our Purposeful investing Course look at ideal speculative opportunities in precious metals. 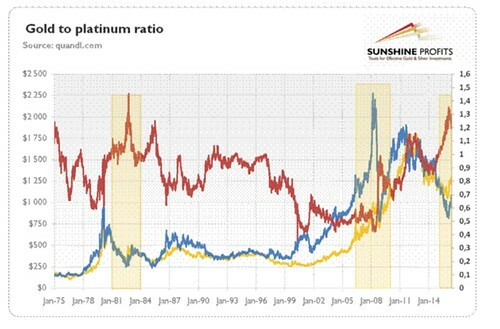 One ideal condition we track is the gold platinum ratio when the price of platinum is lower than the price of gold. Platinum dropping below gold is a historical distortion that rarely happens. Unless there has been a most basic change in the relationship between these two precious metals, whenever platinum costs less than gold, we speculate on the simple fact that platinum’s price will rise faster than gold’s until this distortion has equalized. Yet the facts that dictate the prices of precious metals are rarely simple. For example, there is conjecture that the growth of electric cars will reduce the need for platinum in catalytic converters. This could be since about half of platinum’s demand has been for this purpose. Yet let’s keep in mind, it is estimated, that one-fifth of everything we use either contains platinum or requires platinum in its manufacture. Plus the gold platinum relationship existed well before catalytic converters and platinum still sold for more than gold. Another example is that the price of gold could drop. 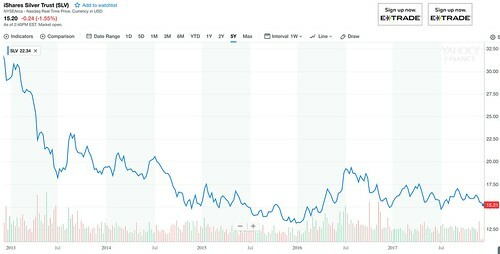 Platinum’s price could rise faster than gold, but if gold is plunging, platinum could outperform gold but stagnate or drop as well. The relationship between gold and platinum is simple, but there are many factors that have an impact on the price of gold. European interest rates, US and global inflation, US interest rates, US dollar strength, US job market, US economic growth, US trade deficit, crude oil are a few. 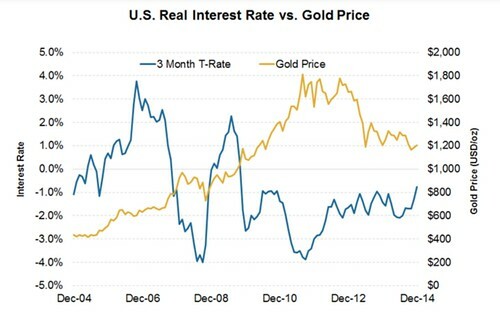 The chart below shows the importance of gold to interest rates. So the current rising trend of US interest rates could hinder a rise in the price of gold. An article at Marketrealist.com: “Why real interest rates impact gold prices?” (1) helps explain why US interest rates matter to the price of gold. Gold is used as an investment alternative. Investors think that it protects money’s purchasing power. As an investment, it has to compete against other investments that are available in the market. The interest rate is a big factor here because it determines the attractiveness of those investment alternatives. As real interest rates rise—interest rates adjusted for inflation—other investments usually become more attractive. This reduces the demand for gold and vice versa. Gold usually has an inverse relationship with real interest rates. Rising US interest rates are a downwards pressure for gold prices and gold-backed exchange-traded funds (ETFs). Since gold and platinum (and silver) are related, US interest rates also have an impact on these precious metals. What many investors miss is the fact that Chinese and Indian interest rates are also important factors that affect the price of gold. Both Chinese and Indian cultures have a historical leaning towards trusting and owning gold. They are becoming increasingly important factors as China and India become larger parts of the global economy. If one eliminates Switzerland (the biggest importer of gold with over 70 billion worth of gold imports), Asia is the largest importer of gold (90 + billion worth compared to Europe’s 30 + billion). China and India are the two largest Asian importers by far. Increasing yuan and rupee real interest rates will stimulate investors to build up savings in those currencies instead of gold. This is a downward pressure on gold prices and gold-backed ETFs. After more than a year of steady interest rates, in both February and March 2017, the People’s Bank of China raised yuan interest rates. Indian interest rates continue to fall, but should also be watched. Here is another interesting question. If interest rates in these Asian countries impact gold’s price, what would be the impact of an Indian/Chinese conflict or war? China and India have long had border tensions. There was a Sino-Indian War in 1962 over disputed Himalayan borders. 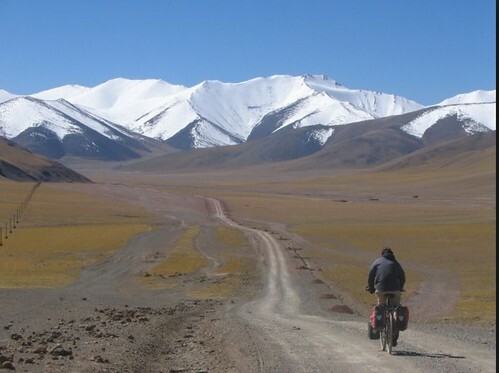 At that time, the Chinese launched offensives in Ladakh and across a line (McMahon Line) regarded by India as the legal national border that disputed by China. Disagreements have remained since that time. 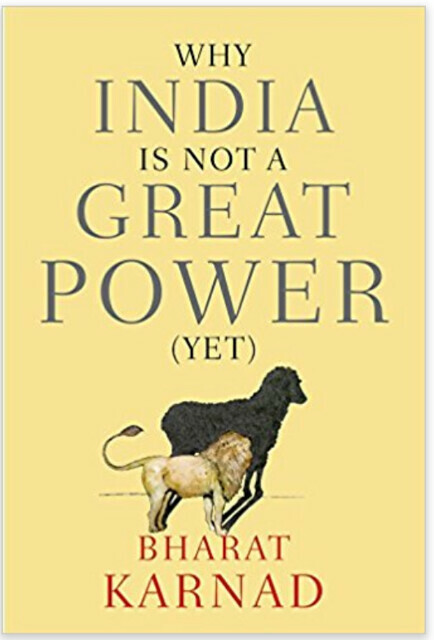 The book “Why India Is Not a Great Power (Yet)” by Bharat Karnad, outlines a number of events that could lead to a Chinese Indian conflict. One of the causes could be these tensions that include border skirmishes. Tibetan protests and maritime disputes are others. Karnad, a professor of National Security Studies at the Centre for Policy Research in New Delhi, suggest that India should be more aggressive to increase its position on the world stage. His suggestions include nuclear land mines in the Himalayan passes, arming China’s neighbors like Vietnam with cruise missiles and atomic weapons, and actively assisting armed uprisings in Tibet. Could any of these steps create a spike in the price of gold and consequently silver and platinum? 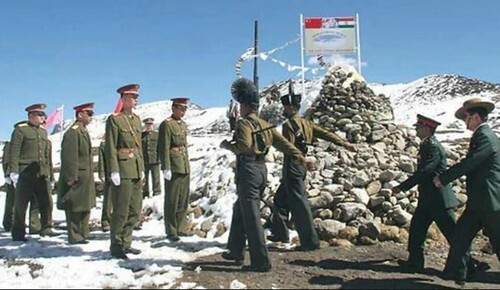 This image from India.org (3) shows a meeting between Chinese and Indian military at a conflicted border. What happens if minor arguments as described in the article turn into something more serious? The distance of Tibet to the US east cost is about 8,500 miles. What events, so many miles and times zones away, might be taking place that can have a serious impact on our wealth? The answer is that we do not know and this is why ownership of precious metals is a speculative proposition. Rising interest rates in China and India could cause prices to fall, but a skirmish or two or the planting of a few atomic mines and precious metal prices could skyrocket like they are nuclear powered. Well, in a way they would be. There is always something we do not know which is why when we speculate, especially in precious metals, we never risk more than we can afford to lose. We leave plenty of time for the investments to mature. Our recent Pi Update explains how to calculate profit and loss in precious metal speculations. What is the real value of gold? Everyone should have a holding in precious metals, but as an investor who started accumulating (and speculating in) gold almost 50 years ago, I have learned (often the hard way) that precious metals should only be accumulated when their price makes them a good value. This begs the question, “When does gold’s price represent good value?” Today I am sending you a deep analysis, based on this 50 years of experience, of gold’s pricing in terms of inflation that helps answer this question. This research is part of a $39.99 report, but I am sending it to you free and without obligation. A collapsing US dollar is one of the greatest risks we have to our independence, safety, health, and wealth. Yet there are many signs that the greenback’s strength is in serious jeopardy. One frightening statistic is the $502.25 billion trade deficit that the US logged in 2016. This is the largest deficit in years. Many factors such as growing federal budget deficits and low national savings mean that trade deficits are likely to widen even more. The growing federal budget deficits also increase the national debt. When the Dow Jones Industrial Average recently passed 20,000, another milestone of “20” took place that has a much darker meaning to your and my spending power. The U.S. national debt passed the $20 trillion mark. The problem is that the Dow is likely to come back down. National debt probably will not fall. In the past decade US debt nearly doubled and according to the Wall Street Journal, the Congressional Budget Office estimates that the rate of debt will continue to rise for at least ten more years. That debt we are looking at is all the debt issued by the US Department of the Treasury since 1790 but does not include state and local debt. And, it doesn’t include so-called “agency debt ( debt issued by federal agencies and government-sponsored enterprises) which is “guesstimated” to be another $8.6 trillion or so. And, these dreadful numbers do not include the so-called unfunded liabilities of entitlement programs like Social Security and Medicare. Federal National Debt per person is about $60,923. If one adds in all the other debt each and every American owes over $100,000! How can America pay this back? The answer is they cannot. Payback however actually does not matter. No one expects the US to pay back their debt. Investors do expect the US to pay interest on its debt and this is where a big really problem looms… in rising national debt service. During most of the last decade when the national debt was skyrocketing, interest rates were plunging and have remained really low. Now rates are expected to rise as will the US debt service. The chart from the Congressional Budget Office (CBO) shows that debt service is expected to more than triple in the next ten years. This is an extra half trillion dollars a year that won’t be spent on roads, on the military, on health care or the environment or schools. That rising debt service creates a vicious cycle that can only lead to a devaluation of the US dollar so the debt can be paid, but in phony terms. This is why investors need to own gold and precious metals. However because metals are commodities and markets fluctuate for many reasons, gold is not always a good value. 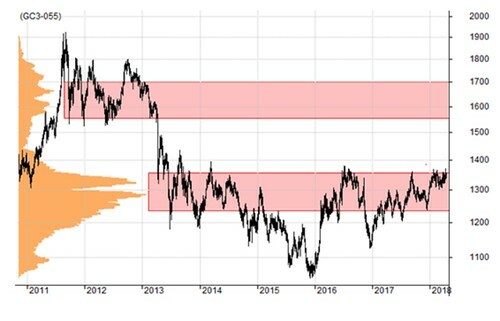 Good value investors look for “ideal conditions” before they invest long term in gold because there are times when a rare distortion in gold’s pricing occurs and the price drops to a point (that history has shown) where it will “almost always” rise. The words “almost always” indicates that there is risk. There is risk that a basic fundamental has changed and the distortion will not correct in any targeted period of time. Or a new fundamental has shifted dynamics to such an extent that the distortion never corrects. There is always risk. Profit is the reward for taking that risk, but there is always a chance of loss which is why we should always seek a price that represents good value. This is not as easy as it would seem because inflation is hard to define. Gaining a true perspective on gold’s value is also difficult because the price of gold was fixed for many years. The gold price was fixed at $35 an ounce before and at the end of WWII and this fixing did not take into account the huge inflation this conflict created. This also impacts any accuracy in understanding what the real the price of gold should have been at the end of the war. These factors distort the accuracy of the answer to… “How much is gold really worth now?” What is its real value? This is truly THE golden question. Here are a few theories that can help us understand the relationship between the price of gold and costs of living. First we use gold’s 1944 price and the costs of houses and cars and wages at the same time. Since the mid 1940s US median income increased 29 times. House prices rose 47 times. The cost of cars jumped 36 times. Gold failed for keeping up with education. The biggest increase is for a Harvard tuition, up 107 times. Or does this mean that a Harvard education has become a really lousy value? That’s a question for another time. Another way of looking at inflation is to lump all the price increases together. In this instance, according to the inflation calculator website that uses the graph above, prices overall have risen 13.7 times since the end of WWII. This second comparison would suggest that gold, up 35 times, has risen far more than inflation and is not a good value at $1,225. However because the price of gold was fixed at $35 an ounce, the original price must be suspect. If we use the 1944 inflation rate and compare it to the the price of gold in 1971, we see a value conclusion similar to comparison #1. Gold is a fair value at around $1,225. On the other hand gold’s price rise from 1971 is still much higher than inflation from 1971 until now. The the inflation calculator website’s chart below shows inflation since 1971 has pushed prices up 5.8 times. This would suggest that gold around $696 an ounce would be a good value. However since the $35 an ounce gold fixing obscures the true price rise, if we split the price half way between the $35 and 1971 price ($120), we get perhaps a more accurate view. The adjusted price is $77. If $77 was a more accurate real value for gold in the mid 1940s, then its price has risen 15 times and is in line with the 13.7 times cost of living increase. In this comparison gold’s actual price is almost the same as its adjusted purchasing power price, around $1,235. These comparisons crystallize the fact that there is risk when it comes to speculating in gold. They remind us never to speculate more than we can afford to lose or at least hold for extended periods of times. They also remind us not to catch a gold fever when we read claims of $2,000 or $5,000 an ounce gold! Eventually the huge American debt will fire up inflation again and that will eventually turn into mega inflation. Then gold prices may shoot that high. In the interim whenever gold drops below $1,225, its probably a good value and investors who accumulate below that price will do well. A great deal of economic news is opinion, conjuncture or based on statistics that are often falsified or misconstrued. Plus the news we see is prejudiced by what commerce thinks we want to see. Advertising revenue is the driving source of news. Audience determines ad rates and ad rates determine profits so all the news is aimed at attracting readers, not necessarily informing them. Plus a lot of economic news is unreliable, or so unusable that it will just waste our time. Let’s look at an example of a very recent economic news about the price of gold and the US dollar. A February 24, Wall Street Journal article said “Dollar Edges Higher With Trump Speech Looming” (2). 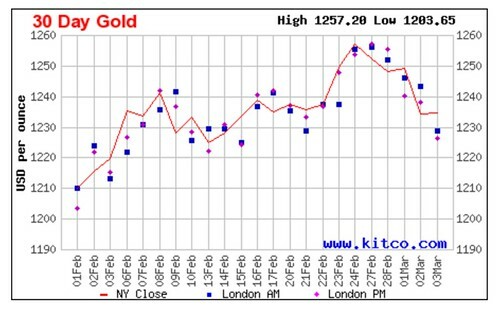 The Kitco gold chart above shows that yes gold did rise and fall, but the information was basically useless. Gold’s price (in dollars) was falling when the Journal suggested it was rising and on February 25th gold’s price was falling when the Journal said it was rising. More importantly the rising and falling was nominal. Only huge leveraged traders could have earned more than the cost of trading gold that week. Overall, for the week, the price of gold had a blip and then ended almost exactly where it began. To have read this economic news was a waste of time. Even worse, to have acted on what was written would have been a waste of money. We need to use mathematically based financial news to make investment decisions. The excerpt from our Purposeful Investing Course (Pi) outlines how investors use the Pi strategy in up to seven layers of tactics based around Financial News. 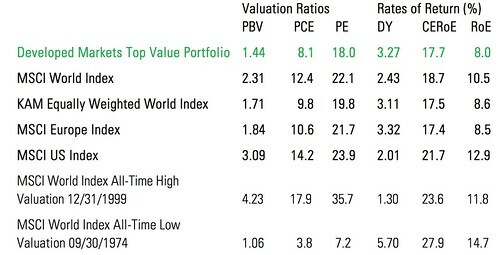 Pi Tactic #1: Determine purpose of investing and use math to reveal good value in stock markets around the world. Pi Tactic #4: Use trending algorithms to buy, sell or hold these good value markets. Pi Tactic #5: Add spice speculating with “ideal conditions”. Here is another excerpt from the course that shows how to use math to determine “ideal conditions” for the price of gold. The mathematical ratio to work with for gold is its price in relation to inflation. The goal is not to determine if it will go up or down in the short term. Gold’s price will rise and fall, sometimes too much, sometimes not enough. When investors have a value line to determine when the price is too low, then accumulating gold for the long term increases the odds of profit. This excerpt shows how Pi determines the value of gold. #1: Gold price to inflation. This is perhaps the most speculative of the ratios since a meaningful inflation rate is hard to define. Statistics can be misleading. In the Silver Dip Report 2017 there is an analysis of inflation that shows the median house price has increased 49 times but the average American house has changed greatly since 1944. Gaining a true perspective on gold’s value is also difficult because the price of gold was fixed for many years. The gold price was fixed at $35 an ounce at the end of WWII. The fixing did not take into account the huge inflation this conflict created. This also impacts any accuracy in understanding what the real price of gold should have been at the end of the war. These factors can distort the accuracy of the picture. How much is gold really worth now? What is its real value? This is truly THE golden question. First, we use gold’s 1944 price and the costs of houses and cars and wages at the same time. Since the mid 1940s US median income increased 29 times. House prices rose 47 times. The cost of cars jumped 36 times. If these conclusions are accurate, it means that gold was a reasonable hedge against inflation. Had you stored a pile of the precious metals away in 1942 to buy a car, you could do it. A house maybe not, but again the statistical house purchased today might be very different from the statistical house purchased in the mid 1940s. The gold cost of living relationship is true for the cost of going to a movie, up 33 times. Apartment rentals are up 34 times. But other basics have inflated far less. Gas is up 19 times, but of course bounces around a lot. Postage: 16 times. Bread: 21 times. Sugar: 10 times. Hamburger about 13 times. Coffee: 11 times. Eggs: 13 times increase. Milk: 16 times. Gold failed for keeping up with education. The biggest increase is for Harvard tuition, up 107 times. Or does this mean that a Harvard education has become a really lousy value? That’s a question for another time. This first comparison suggests that gold is not necessarily badly undervalued. If the conclusions of the inflation are correct, this first comparison suggests that anytime gold drops below $1,225, it is likely at a fair value, about where it should be priced in relationship to other costs of living. If we use the 1944 inflation rate and compare it to the the price of gold in 1971, we see a value conclusion similar to comparison #1. Why 1971? That’s the year President Nixon told the Fed to stop honoring the dollar’s value in gold. That meant foreign central banks could no longer exchange their dollars for U.S. gold, essentially taking the dollar off the gold standard. Unhinged from the dollar, gold quickly shot up to $120 per ounce in the open market. This $120 price is a glimpse of what the correct price of gold may have been in the mid 1940s. On the other hand, gold’s price rise from 1971 is still much higher than inflation from 1971 until now. Then the inflation calculator website’s chart below shows inflation since 1971 has pushed prices up 5.8 times. This would suggest that gold around $696 an ounce would be a good value. However, since the $35 an ounce gold fixing obscures the true price rise, if we split the price half way between the $35 and 1971 price ($120), we perhaps have a more accurate view. The adjusted price is $77. If $77 was a more accurate real value for gold in the mid 1940s, then its price has risen 15 times and is in line with the 13.7 times cost of living increase. The same site has this chart showing the price of gold based adjusted to the Consumer Price Index from 2015 till now. In this comparison, gold’s actual price is almost the same as its adjusted purchasing power price, around $1,235. The comparisons above are indicators that the price of gold is likely to continue rising and falling along the cost of living increases from a current fair value of $1,225. This is the premise we use at Pi. We keep the $696 price in mind when we calculate potential drawdowns, in case the assumption of a $1,225 fair gold price turns out to be horribly wrong. These comparisons crystallize the fact that there is risk when it comes to speculating in gold. They remind us never to speculate more than we can afford to lose or at least hold for extended periods of times. They also remind us not to catch gold fever when we read claims of $2,000 or $5,000 an ounce gold! Unless inflation turns into mega inflation. We are living in a high tide of news. News can flood our every waking minute if we let it. When it comes to investing, if we cut out the economic news and rely on mathematically based financial news instead, we gain time and reduce the frantic nature of our modern world. This can reduce investment trading costs, help ease the behavior gap most investors suffer. Turning off the economic news makes life less stressful and more comfortable and profitable as well.